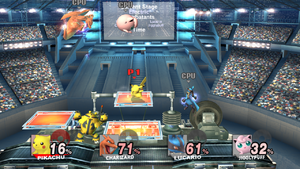 Pokémon Stadium 2 also has a very minor role in the Subspace Emissary. After completing the Story mode, the player can go back to the Swamp stage, and enter a newly placed red door. 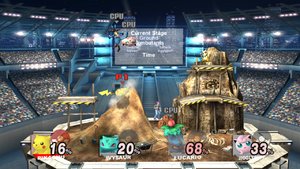 By entering it, the player will face Jigglypuff; if beaten, it will become playable. If not, the player will be taken back to the Emissary map, and the level will end with the "Stage Clear" Screen. 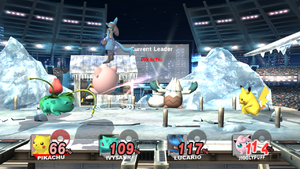 The door to the Jigglypuff battle will stay until Jigglypuff is unlocked. 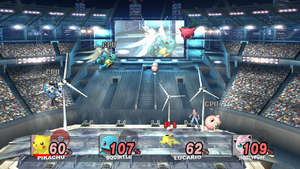 In Super Smash Bros. Brawl, the unlock match for Jigglypuff takes place here. 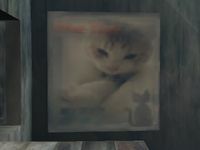 A poster with a picture of a cat that resembles the Wii Hint Cat can be seen inside the house where Snorunt resides. It is unknown whose cat it is; Masahiro Sakurai has confirmed that it is not his, despite major rumors to the contrary. ↑ Masahiro Sakuai's Twitter @Sora_Sakurai Retrieved November 29, 2014. This page was last edited on December 4, 2018, at 10:17.